Today I want to tell you about an energising, beautifying, health-promoting substance that costs just pennies per day and takes just seconds to prepare: matcha green tea. You’ve probably heard about the benefits of green tea many times, and you may also have heard of matcha, but you may not know how it differs from regular green tea. It’s actually a really important difference: matcha is a fine powder made of stoneground green tea leaves, so when you drink the tea you are actually consuming the leaves and all of the vitamins, minerals and antioxidants they contain. In regular green tea, you do not consume the leaves – they are left behind in the teabag, or teapot, so the only nutrients that make their way into your system are those that infuse out of the leaves into the water. 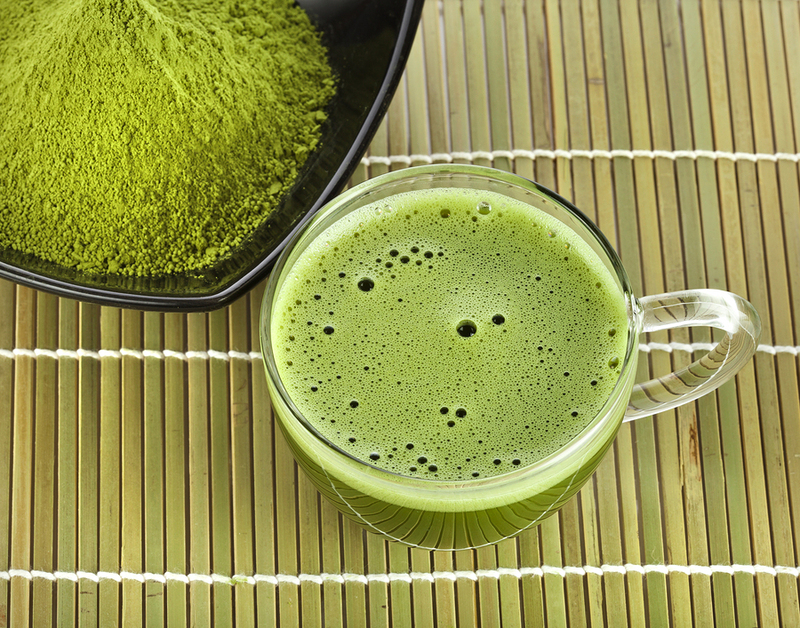 This is why matcha green tea is at least 10 times as nutrient-rich as the regular variety. You can easily see this difference just by comparing a cup of pale regular green tea to the opaque dark green you see in the photo above. Yet despite being stronger than other green teas, matcha is actually less bitter – in fact its taste is wonderfully mild. All green tea has anti-inflammatory, anti-bacterial and anti-viral properties, thanks to its antioxidant content. But when it comes to antioxidants, matcha is in a class of its own. Blueberries and pomegranates are known as two of the most antioxidant-rich foods, but when scientists at Tufts University compared matcha to these superfruits they discovered that it possesses an amazing 20 times more antioxidants. It does, and here are the stats. You need around 1g of matcha powder to make a large (16oz, or nearly 500ml) cup of medium-strength matcha, and this will give you 35mg of caffeine. You may drink smaller cups of tea than I do, in which case the caffeine content will be lower. A large cup of black tea would give you 50-100mg of caffeine, and a coffee of equivalent size would be anything from 200mg to over 300mg. 1. Regularly drinking green tea may slow the aging process, both on the inside and on the outside, due to the abundance of antioxidants and their free-radical-scavenging and anti-inflammatory properties. 2. The antioxidants in green tea protect the skin against sun damage. 3. Green tea reduces bad cholesterol in the blood and improves the ratio of good cholesterol to bad. 4. Green tea cleanses the blood thanks to its high chlorophyll content (again, just look at that greeeen). Chlorophyll is a powerful detoxifier, helping to eliminate heavy metals and other toxic substances from the body. 5. Green tea boosts both metabolic rate and fat burning. One study found that exercising immediately after drinking matcha green tea resulted in 25% more fat burning during exercise. 6. Green tea also helps regulates blood sugar, preventing insulin spikes and the resulting fat storage. 7. Green tea protects against cancer. There are many reasons for this, but the one that has interested scientists the most is an antioxidant called EGCG which is substantially higher in matcha green tea than in any other substance we consume, and is believed to be a powerful anti-carcinogen. 8. Green tea can help normalise blood pressure and can also help keep the lining of blood vessels relaxed and better able to withstand changes in blood pressure. 9. Green tea may also protect against the formation of clots, which are a leading cause of heart attacks. 10. Green tea protects against gum disease and tooth decay due to its anti-inflammatory, anti-bacterial and anti-viral properties. 11. Regularly drinking green tea lowers Alzheimer’s risk due to its protective effect on brain cells. 12. Green tea can enhance mood and concentration and protect against depression. This is thanks to L-Theanine, an amino acid naturally found in tea leaves. Matcha first arrived in Japan, over 1,000 years ago, to aid Buddhist monks in their meditation practice, as it helped them remain alert yet calm. And like meditation, L-Theanine increases alpha wave activity in the brain, which promotes feelings of relaxation and wellbeing. I love Clearspring’s Organic Matcha Green Tea Powder which retails at £9.99 for 40g. 1. Boil the water and let it cool for five minutes before mixing in the matcha powder as it can otherwise taste sorta “grassy”. 2. When you add the matcha powder to the hot water you have to whisk it or it will form clumps. The traditional way is to use a special bamboo whisk. I bought one, it looks beautiful and I still get it out on special occasions. But for everyday use, I cheat and put the powder and hot water in the blender – this gives a perfectly blended cup of matcha in five seconds, with no manual labour. Previous articleIs agave syrup a healthy alternative to sugar? Of all the green powders I’ve tried, and I’ve tried them all, matcha seems to give the biggest energy infusion. Even though it has some caffeine it is a really calm, focused energy unlike that from say coffee or cacao. I drank tea all day and night, so I am trying to find green tea that I can brew and drank as much as I like. With sugar or honey. Some green tea varieties are lower in caffeine than others and you can Google this until you find one that appeals to you and that you can easily source. Another tip: make it with water that is very hot as opposed to boiling (by leaving the water to cool a little before pouring) and only brew the tea for 1-2 minutes. Yay! I just checked out your site. I’m excited to read about your plans – please keep me posted! Hi! How are you? I am great, my question is u say 1 gram of matcha equals to 35mg of caffeine, so how many grams of matcha should be consumed per day to receive all the excellent benefits from matcha powder? What is the serving size per cup and how many milliliters are in grams? I have a half a teaspoon and a teaspoon size which is 2.5ml and 5ml, so how many grams are in 2.5ml and 5ml? I am new to matcha so I am just doing my research before I purchase it? Thank You! One regular-sized cup a day is enough, made with anything from a quarter (1 gram) to half (2 grams) of a teaspoon of matcha powder. Play around and see what tastes/feels better to you. where can i buy matcha tea in london, uk. south london to be a bit specific? Hi Michael – I don’t know South London well but I’d guess the Wandsworth branch of Planet Organic would have it. If I can’t get it anywhere else, I order it on Amazon. I started drinking Green Tea several months ago, when I caught a cold. It cut the cold in half! My fianc√© just recently bought me the brand “The Republic of Tea” It’s Green Tea with Matcha powder. It’s my favorite now! I love it! I was wondering if you have tried it this way and if you think the benefits are still high when Matcha is infused in Green Tea bags? Also, one more thing I’d like to ask is, I live in United States, what is the best Matcha Green Tea available here? I clicked on your link for the Clearsprings Organic, I was going to purchase the organic tea bags, but there wasn’t an option for my country. I unfortunately haven’t been to the United States since I discovered matcha green tea so I can’t advise as to best brands. The one you’ve been using is organic and the one piece of purchasing advice I would give is do definitely go for organic to ensure best quality and highest purity. On doing a quick web search I see there appear to be quite a few US brands offering organic matcha powder. Happy sampling! Hi. I just wanna know if Lipton Green Tea is good as well? This is not a brand I’ve looked into but as a general guideline, I’d recommend picking an organic green tea. I’ve always enjoyed tea,I started drinking green tea several years ago,I use Oolong tea, it is so uncommon. Can you write about it? I can’t get hold of matcha at the moment and I’m wondering if there is any reason why I shouldn’t just grind green tea to a powder at home. Or even (and thanks for this great tip) blend it until smooth with some cold water and then add hot water to it? I’m too impatient to wait for the water to cool down, so I pour cold water into the mug first and then add the freshly boiled water. Great list, Sarah. I try every day to start my morning with green tea. and I love Clearspring’s Organic Matcha Green Tea Powder. I haven’t tried matcha yet but from all the things I’ve been reading about it I might have to hunt some down. Ahhh this is perfect thank you for this, this is perfect for me! I must admit, I’m a little bit of a tea rookie I can’t lie, but my best friend ADORES all different teas and tea leaves and everything, and I’m trying to find her a good birthday present, hence I’ve found myself here! I really want to get her a tea related present as I know she’d LOVE it. I’m just wondering really what the best teas to get would be? I know she likes oriental teas as she was talking about them the other day, so does anyone have any suggestions at all? I need all the recommendations so please hit me up with some haha! I know she likes the flavoured ones like berries and lemon and things like that so anything along those lines would be great if anyone knows any interesting and exciting flavours! I want to get some really fun ones for her to try! Also in terms of green tea (definitely getting her some of that – she’s obsessed haha) am I better getting her a tea bag version or leaves? Is there a difference in taste? Is it down to simply personal preference? Or is one more special than the other? Again please hit me up with any advice or recommendations you may have as I’m far from an expert on this type of thing! Also are there any special biscuits that go with green teas etc? I would quite like to get her a full little tea set little thing, so biscuits would be quite a nice touch 🙂 Anyway sorry for rambling haha – like I said – would love to hear people’s recommendations and advice! Thank youuuuu everyoneeee!